Hey guys! I have a quick fun mani to share today! I recently made my first purchase from The Hungry Asian Etsy Shop, Sneeze Breeze! Sneeze Breeze is a super unique black and blue glitter polish, I was so excited to try it out but I didn't want to just paint my nails with it, so I decided to try something a little different/funky with it. For this mani, I painted my nails with Deborah Milano 837 which I got in a swap from my lovely friend Maki from Candy Glaze. I then sponged Sneeze Breeze onto the tips and most of the way down the nails. I really love how this look came out! It was super fun! NOTE: I did have to use a generous application of Seche Vite in order to smooth out Sneeze Breeze, but it was SO worth it! What do you think of this mani? 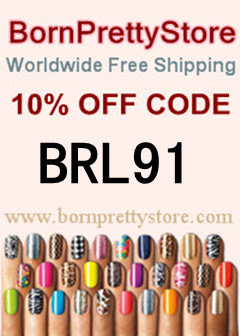 Have you purchased any cool Indie polishes lately? This is great! I'm going to have to try sponging Sneeze Breeze on! I have bought sooo many really cool indie polishes, my current favourite is Yellow Cake by Elemental Styles, it glows in the dark! This is such a great mani!!! Love The Hungry Asian polishes. Strawberry is my favorite. Nice! I purchased her Twenty-Ten a few weeks ago. I also ordered Ringer by Darling Diva after seeing Polished Claws Up blog post about it. I was skeptical about it but I want to give it a try after see some good pics of it. Stunning! I love the way it turned out. Very nice! I spent a portion of yesterday perusing indie polish sites, but didn't buy any yet. I did get curious about how you make frankens though! Cute! 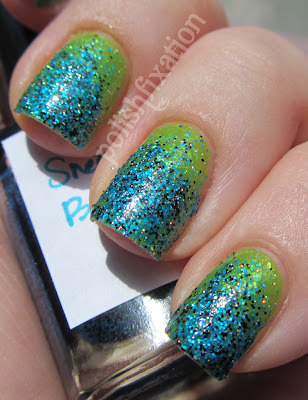 When I wore Sneeze Breeze, I had to use two coats of gelous and two of SV and it was STILL gritty! Ooh wow, that looks really great! Good choice of base colour. I just put this on last night and wasnt happy with it as a mani on me straight up, but LOVE the color and finish, so I am definately going to do this and give it a second chance!! Love it!! I haven't gotten any indies for a while, but Polished Components has a couple I've had my eye on. Oh I love it! It looks so fun! I still don't have any indy polishes, such a shame! this is so cute.. I just got a mini bottle of sneeze breeze and I can't wait to try it! !